It is estimated that nurses walk on average four miles per shift. While this can be beneficial for the health of the nurse, much of the time spent walking is not productive. This time away from patients is spent doing essential tasks moving between the workstations to input data about the patients, looking at electronic medical records and getting the required medication for the patients. Can you imagine how much time would be saved if everything required for each patient was with the nurse all the time? No walking across the ward to retrieve information, dose medication and dispose of sharps. 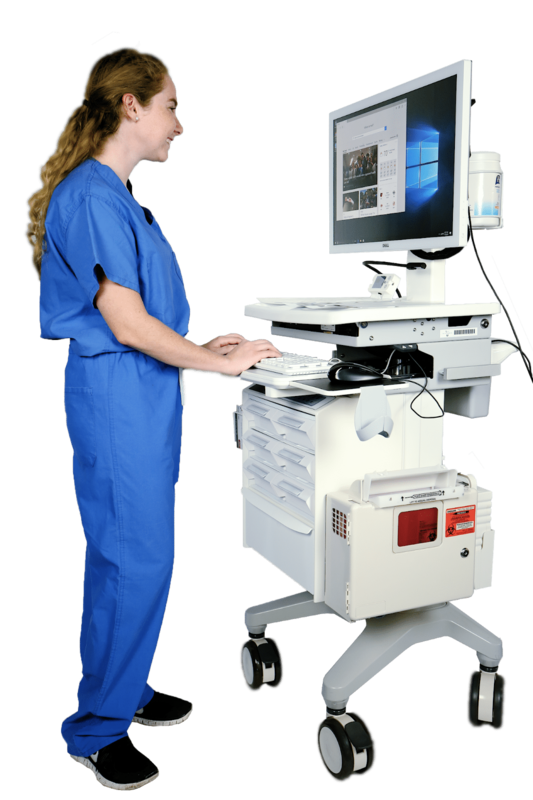 Industrial laptop carts are essentially a complete workstation on wheels which can be moved around the hospital floor by the nurse. The workstation contains everything the nurse will need for checking on each patient. Electronic records are updated at the point of care, so there is less scope for errors, details being forgotten or handwritten notes misinterpreted which considerably increases efficiency and improves patient care. In addition to the computer functionality, there is an array of lockable storage units on the cart which can be used to store medications, disposables, and even sharps. Valuable time is saved by having these immediately on hand without having to return to a central point to collect supplies. An essential feature of the industrial laptop cart is the way it is powered. They are supplied with two rechargeable lithium-ion batteries which have an exceptionally long life, with an 80% increase in power storage and a 50% reduction in charging time. This means that not only will the medical laptop cart not run out when you most need it, but also when it comes to charging there won’t be much downtime while waiting for it to be ready. It is unlikely the cart will ever run out of battery unexpectedly though. The bright status light gives a clear indication of the remaining battery life so you can always be aware of how much working time you have left before a recharge is needed. Additional battery packs can be supplies, and because common battery types are used between the different cart models, if needed they can be swapped from one cart to another. The industrial laptop cart is made to be exceptionally strong, with an aluminum frame which can easily handle the full loaded weight of the batteries, computer, printer, medication, and supplies. Despite the heavyweight construction, the actual product is surprisingly lightweight. The smooth riding wheels make moving the cart around the hospital easy. Many users will be expected to use the medical laptop cart, and the design takes into consideration the range of different users. The most frequently used feature of the cart is the computer with which data will need to be input or retrieved for nearly every patient. Leaning over the computer keyboard or reaching up to it when in the wrong position can cause strains and aches. 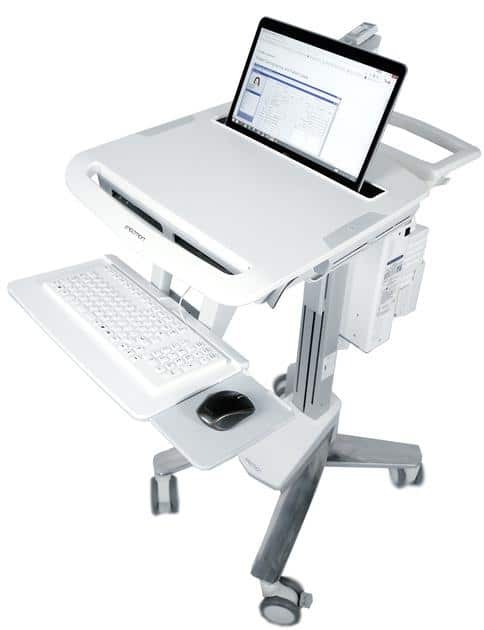 The medical workstation on wheels is fully height adjustable so it can be put in the perfect position for each user.